We kept boiling in the single stock pot, adding sap whenever it got low. We turned it off at night, but otherwise kept it going all day, every day from Sunday the 22nd until this past Friday the 27th. We went through 15 gallons of propane. 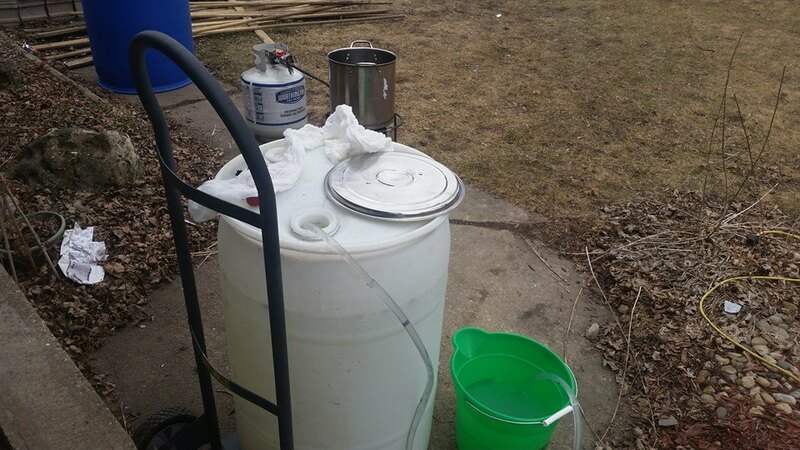 The trees were producing sap at a prodigious rate, so we struggled to keep track of the total number of gallons we went through, but we’re guessing in the end we collected over 50 gallons total, and put maybe 25 into the first batch. Our neighbor also offered to let us put a tap in his maple, so long as he got a jar of syrup. At one point, the buckets were filling up over night, being emptied first thing in the morning, and then being emptied twice more during the day. The weather that week really was perfect- mid-40s into the 50s during the day, dips to freezing at night. Thursday the 26th, we brought the syrup inside to finish briefly on the stove, and bottle. However, due to poor temperature control, and the extended boil time on this first batch, it came out exceptionally dark. If we were a commercial set up, this would not be graded for human consumption, though there’s nothing actually wrong with it. Maple syrup grading is just exceptionally finicky. 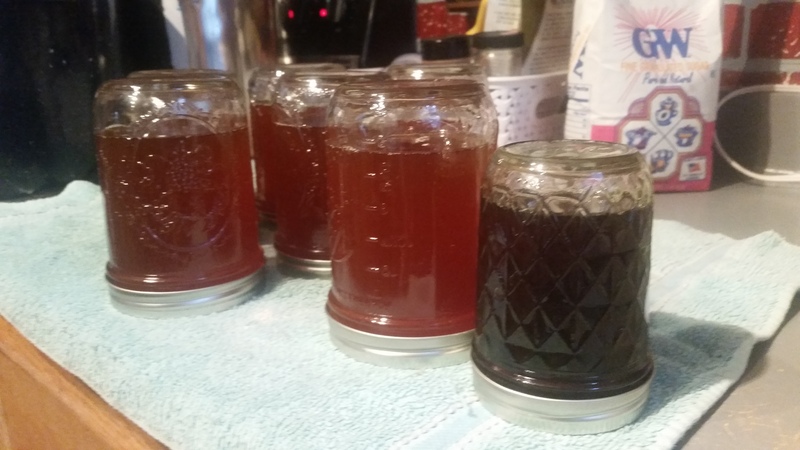 I think the first batch is a wonderful bittersweet, and I’ve taken to calling it maple molasses. Filtering the finished syrup through an ultra-fine mesh. So far, it had been filtered through only cheese cloth. It was mostly free of sticks and bark, but some small amount of dirt probably was present, as well as some bitter by products of the cooking process. Good clarity, but very dark. The second batch began Friday morning. Matt picked up 3 additional stock pots, and we prepared to go on a maple syrup boiling bender over the weekend. We kept the burner outside going, and put 3 pots of sap inside, reserving the fourth burner for finishing. Using a candy thermometer clipped to the outside pot, and a standard meat thermometer inside (I really, really want one of those infrared remote thermometers now), we carefully monitored this batch’s temperature. Checking on it every 30-60 minutes or so, we kept the syrup in the 200-210 degree range. While the volume in the pots was high immediately after putting in fresh sap, we were fine with the temp climbing to 210, but once the volume dropped by about half, we kept it much more carefully at 200. The higher concentration of sugar meant it was more likely to scorch, likely causing bitter flavors like the first batch. In addition to monitoring the temperature more closely, we did not blend this batch until all the stock pots were reduced by about 80-90% in volume (roughly 2-4 inches of liquid at the bottom of the pot & a light golden color). In this way, we hoped to further prevent scorching, since the sugars would not be concentrated, then diluted, then concentrated, etc. I’m writing this late Sunday afternoon, and we were not able to keep the outside burner going today, due to some pretty heavy sleet and freezing rain (ah, Spring time!). We brought it inside, and had all four burners on the stove cranking. We also blended all four pots of the second batch into the finishing pot, boiled them down further (still at 200F), until it was darker in color, and the bubbles moved sluggishly to the surface. 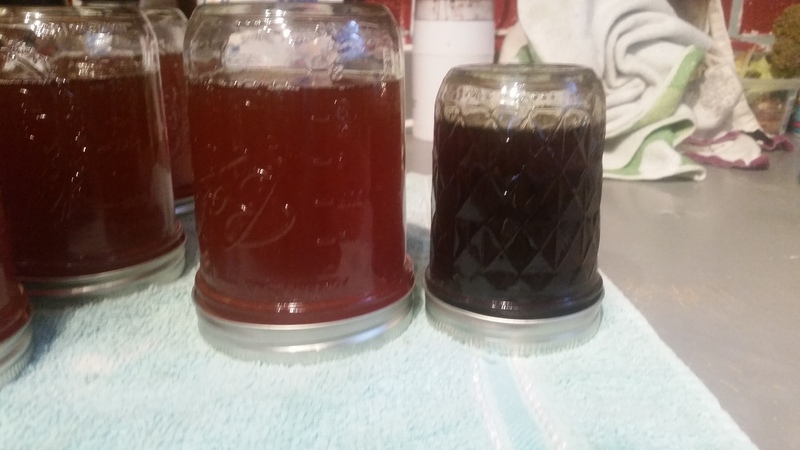 It went into pint jars, and came out much more purely sweet, and lighter in color. First batch on the right, second on the left. Six pints, plus one 8 oz ( 1 cup) jelly jar of the second batch. Jarred hot, then inverted to heat the lid and prompt it to self-seal when placed upright and allowed to cool. Further cooking in a water bath could darken the syrup more. The third batch is currently on the stove, and there’s 2-3 more stock pots worth of sap left in the 30 gallon barrel on my porch. Sugar season has just about run its course- this past week was chilly, barely breaking freezing each day, and dipping well below freezing at night, slowing the sap flow quite a bit (freezing up the spiles, most nights). Monday and all of this coming week is supposed to jump up into the 60s, which may mean increased flow for a day or two, but the trees will be budding out soon, and buddy sap means bad flavors in the syrup. Overall yield has been surprisingly high. The ratios I read for sugar maples (ours are silver maples) said 35:1 or 40:1. Silver maples, red & black maples, and box elders are all supposed to be toward the higher end of that ratio- 40:1 or more. We’ve gotten well over a gallon of syrup already (about a gallon and 3/4), and have boiled down about 40 gallons total. This is a very pleasant surprise. 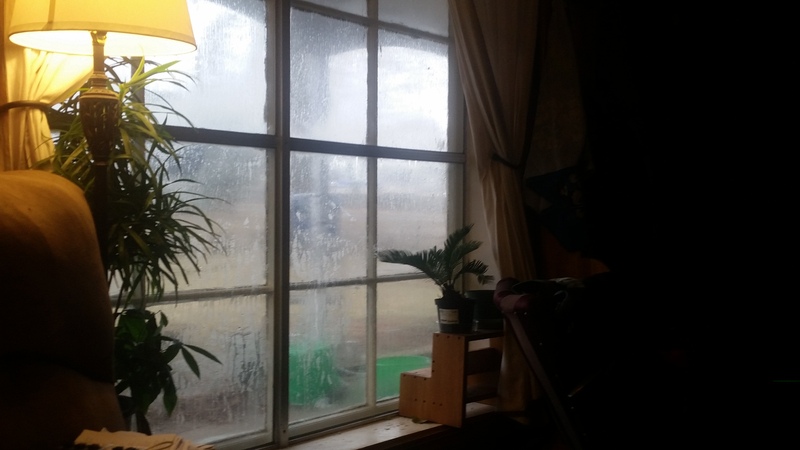 Inside is quite humid- my house plants are loving it. So after reading this I’ve gotten all excited and my dad and I are going to tap some River Birches that are common in the area. I’m at the preliminary stages of course, but I can’t wait for him to read this. Apparently there are about 22 species of trees that can be tapped, according to the google. Temperature wise, you want it cool but not freezing, and before the tree starts to bud, right? That probably means December and January for us. What a cool project. Yeah, I had no ideas so many trees could be tapped! Birches, maples, box elders, sycamores. As for temperature, yes, that’s about the range you want. The sap you get doing this is when the tree comes out of winter dormancy, and the fluctuating temperatures are what get it moving. For us, the best days have been temps in the high 40s and 50s during the day, dipping to near or just below freezing at night. Warmer than that and they dry up, colder and the spiles freeze. That’s mid-March for us, but I know people in Illinois and Missouri who do it in late February. So for as far south as you are, December-January is probably about right. For equipment, you can wing it like us with buckets and bits of pipe, or you can go here: http://tapmytrees.com/ and order their stuff. Our Farm and Fleet (farm supply place) was stocking their things on a little endcap all winter. You’ll also want a place to put the sap until you boil it down, unless you want to cook it down continuously. That honestly wouldn’t be a bad idea for you, if it gets warm, cause it can spoil. I got that 30 gallon barrel (and 2 55 gallon rain barrels for $10) for about 5 bucks off Craigslist. Some food-grade plastic tubing works well to make a siphon- ours was from the homebrewing kit. Of course, there’s tons of info online, too. If you have lots of trees, I’ve seen some cool pictures of set ups tubed together, which we’ll probably use next year if we can get up north. Then of course cheesecloth and filters. Tap My Trees made a nice fine filter, but I don’t see why you couldn’t use a few coffee filters layered together in a colander in place of it. A deep frying spider lined with cheese cloth is also good for scooping the scum off the top while boiling, and for skimming out bark and flies (yes, there were flies even in March). Something else occurred to me- the buckets on the trees make excellent squirrel bait, if you can still shoot them at that time of year. They were knocking buckets off my trees and drinking out of them. They’ll also lick the bark around the tap. Oh be still my heart….making syrup and shooting squirrels? That would be too much fun! Of course, squirrel purists would condemn my plinking of a bushy tail off of a syrup pail as not “fair chase.” But you can bet I won’t hesitate! Seriously though, I wondered how the local raccoon, squirrel, and deer population would take to the buckets of sap. So, my best bet is to tap some sycamore, black walnut, and river birches. They aren’t exactly abundant down here on the coast, but at my parents there’s quite a few. I’m not entirely concerned with fair chase for these squirrels- they’re fat buggers who eat the squash and tomatoes in my garden, in addition to being fed by at least 5 different people in the neighborhood. I’ve seen some of them struggle to jump. Though it was funny to see a bunch of squirrel hair stuck to a spile one chilly morning last week- it was frozen into a bit of sap. Unpleasant surprise for him, I’m sure. I’ve heard of raccoons getting into the sap, and I’m sure deer do, too, especially for the hit of calories at the end of Winter, but before things green up. Luckily bears are still hibernating during sugar season, or I could bet they’d get into it, too. They make lids to fit the branded buckets. What an amazing process! I have to admit though that I don’t see any maple sugaring in my immediate future. Maybe some prickly pear syrup (or even vodka? ).